Grant D. Taylor has been appointed as associate dean of Samford University’s Beeson Divinity School. A native of Tennessee, Taylor holds a B.S. from Union University, Jackson, Tennessee; an M.Div. from Beeson Divinity; and a Ph.D. in biblical theology from Southeastern Baptist Theological Seminary, Wake Forest, North Carolina. 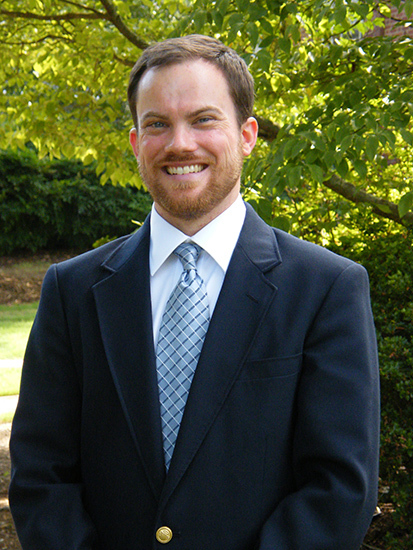 Taylor served in Beeson’s Office of the Associate Dean from 2008-10 and as an assistant to Southeastern Seminary Provost Bruce R. Ashford from 2010-15. He is an ordained Southern Baptist minister, having previously served as pastor of Dogwood Grove Baptist Church in Adger, Alabama, while at Beeson. Kenneth Mathews, professor of divinity and chair of the associate dean search committee, said the committee immediately recognized Taylor’s skills in administration. Taylor is married to Rebecca, and they have one daughter. Kristen Padilla is marketing and communications coordinator for Samford University's Beeson Divinity School.